BAGHDAD - Civilian deaths rose slightly in August as a huge suicide attack in the north two weeks ago offset security gains elsewhere, making it the second deadliest month for Iraqis since the US troop buildup began, according to figures compiled Saturday by The Associated Press. US deaths remained well below figures from last winter when the US began dispatching 30,000 additional troops to Iraq. At least 1,809 civilians were killed in the month, compared to 1,760 in July, based on figures compiled by the AP from official Iraqi reports. 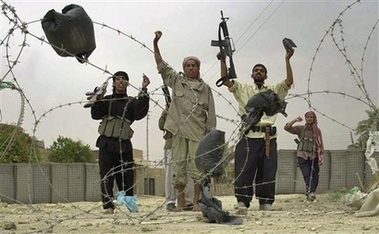 That brings to 27,564 the number of Iraqi civilians killed since AP began collecting data on April 28, 2005. The August total included 520 people killed in quadruple suicide bombings on Yazidi communities near the Syrian border. The horrific attacks made Aug. 14 the single deadliest day since the war began in March 2003. Eighty-five coalition troops - 81 American and four British - died in August, down from 88 the month before, including 79 Americans. The average rate of 2.74 coalition deaths per day was the second lowest since the surge began, and down from a peak of 4.23 per day in May. May also saw the highest number of civilian deaths since the start of the year, with 1,901. US officials have maintained that violence is declining in Iraq in the run-up to a series of reports to Congress this month that will decide the course of the US military presence here. The top US commander, Gen. David Petraeus, was quoted Friday as saying the troop increase has sharply reduced sectarian killings in Baghdad. Petraeus is expected to make the same point when he reports to Congress in about two weeks. "If you look at Baghdad, which is hugely important because it is the center of everything in Iraq, you can see the density plot on ethno-sectarian deaths," the Australian newspaper quoted him as saying during an interview in the Iraqi capital. "It's a bit macabre but some areas were literally on fire with hundreds of bodies every week and a total of 2,100 in the month of December '06, Iraq-wide. It is still much too high but we think in August in Baghdad it will be as little as one quarter of what it was," the newspaper quoted Petraeus, who gave no specific figures. American hopes brightened this week when the most powerful Shiite militia leader, Muqtada al-Sadr, ordered a halt to attacks by his Mahdi Army for up to six months to reorganize and purge it of unruly factions that the US maintains are armed and trained by Iran. "If implemented, Sadr's order holds the prospect of allowing coalition and Iraqi security forces to intensify their focus on al-Qaida-Iraq and on protecting the Iraqi population," the US military said in a statement Saturday.